Whatever your situation may be, chances are that our experienced dentists at Family Roots Dentistry know just what to do to get you out of dental pain in a timely yet comfortable manner. 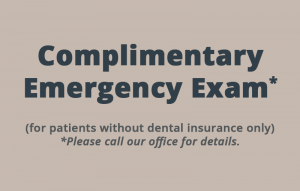 In the event of a dental emergency, it is important to seek dental care right away. Our convenient hours, ranging from early morning to late evening, allow us to do our very best to accommodate your schedule and get you the treatment you need as soon as possible. Our friendly and knowledgeable dental team can also provide you with instructions on how best to proceed and what to do in the meantime to minimize discomfort. call us now at (815) 318-0620 or visit our contact page.